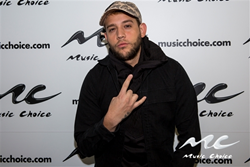 Messiah will be featured in a Latin Trap Music Playlist on Music Choice On Demand. Music Choice continues its promotional partnership with VidaPrimo, the premier digital Latin Music video network, with the platform’s first co-curated playlist highlighting Latin Music’s hottest subgenre. Starting today, the two music powerhouses will join forces to bring the popular underground genre Latin Trap to TV for the first time. Until now, the popular subgenre of Latin Urban music has only been seen through viral videos, social media and concerts. It has been fueled by artists such as Messiah, Ñengo Flow, Bad Bunny, Ozuna, Anuel AA and many more. Lary Over "Tu Me Enamoraste"
Jory Boy "No Te Hagas"
Ozuna "Me Ama, Me Odia"
Fans are encouraged to support their favorite artists by watching videos in the playlist and sharing with their friends on social media. For Music Choice, VidaPrimo not only represents a strong consumer brand in Latin video content, but also brings its sales expertise onto the platform, allowing brands to connect with Latin Millennial consumers on any device. Additional VidaPrimo music videos, playlists and exclusive artist content will launch on Music Choice channels throughout the year. Music Choice offers a robust platform for fans of Latin music, including the largest destination On Demand for Latin music videos, seven Music Channels, and four Video Channels available on your TV and on the go via the Music Choice app. Music Choice also has a robust Latin Tier available on several MVPD’s including Xfinity Latino, Verizon FiOS, Charter en Español and many more. VidaPrimo is a global media company that provides advertisers access to an exploding marketplace of US and Latin American Millennials as they consume the hottest content in the young Hispanic culture. Through agreements with more than 120 of the hottest Latin Rhythm artists, VidaPrimo is one of the largest Latin Music Multi-Platform Networks with presence across YouTube, Dailymotion, Amazon Video Direct and its owned and operated platform on VidaPrimo.com. With 60mm+ monthly views in the US and over 400mm across Latin America, VidaPrimo reaches 25% of US based Hispanic Millennials and an average of 20% of Millennials in Latin American countries. The VidaPrimo advertising platform leverages its massive reach of engaged Latin Millennials and connects them with brands through high quality in-stream video opportunities in front of premium content. Additionally, VidaPrimo offers creative product integration, custom video production and fan activation opportunities.